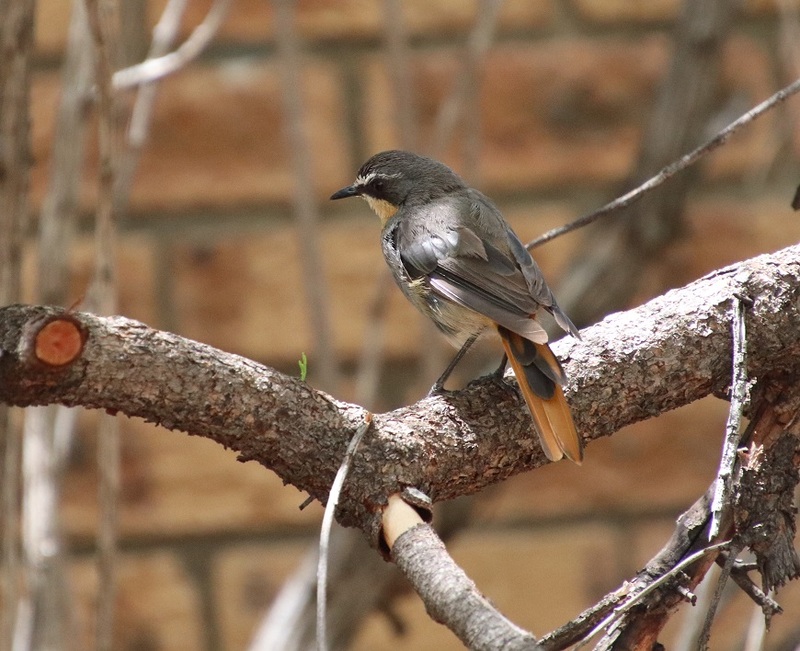 Having heard its melodious calls for two mornings in a row without seeing one, I felt privileged when this Cape Robin-Chat (Cossypha caffra) posed for me on a low branch outside the administration building. 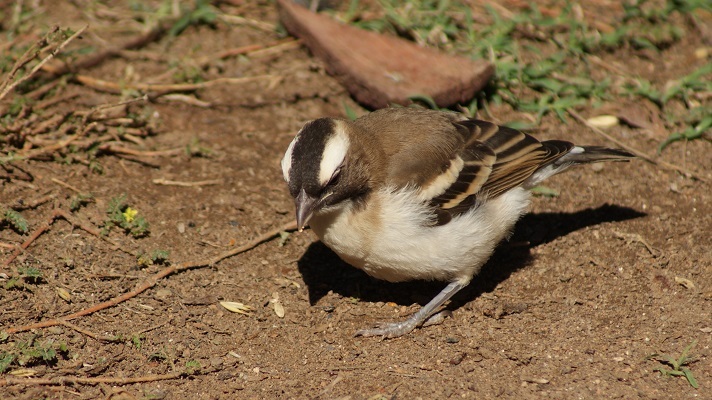 These birds eat insects, fruit and small vertebrates. It is less easy to identify birds while driving. Could this be a Sabota Lark (Calendulauda sabota) posing on a termite mound? 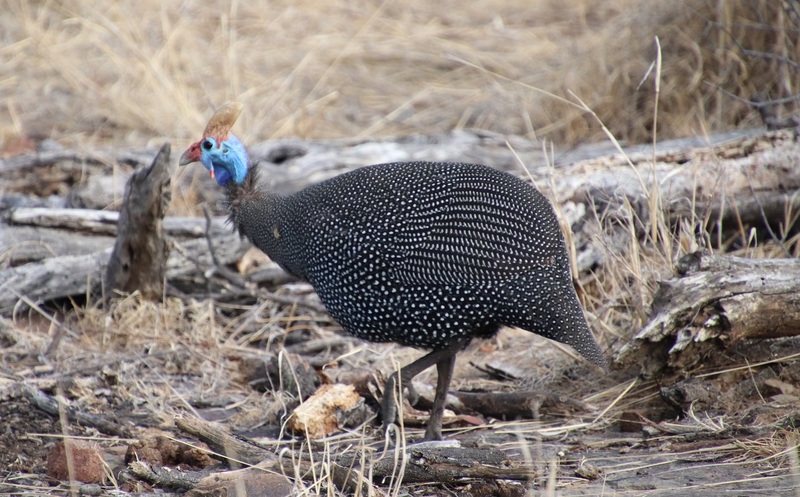 There is no mistaking the Helmeted Guineafowl (Numida meleagris). These iconic birds grace any landscape as flocks of them pick their way through the veld looking for bulbs, roots, seeds and invertebrates. This Ant-eating Chat (Myrmecocichla formicivora) was easy to identify too. 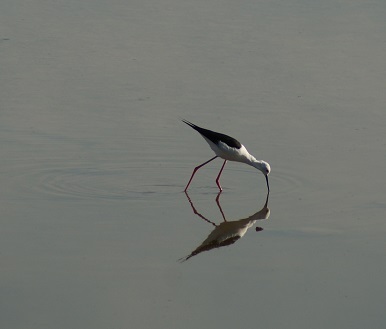 Given how little water there is at the moment, it was a bonus coming across a Black-winged Stilt (Himantopus himantopus) looking for insects, worms, tadpoles, or even small fish at the edge of a dam. Lastly, this Common Ostrich (Struthio camelus) showed no interest in posing for a photograph – he clearly had better things to do! NOTE: Please click on a photograph if you wish to view a larger image. It is a good 57 years ago since our family took a road trip from our farm in the then Eastern Transvaal, through what is now KwaZulu Natal and on to what was still known as the Western Cape. This was an exciting experience which broadened our horizons in terms of the wonderful landscapes South Africa has to offer. 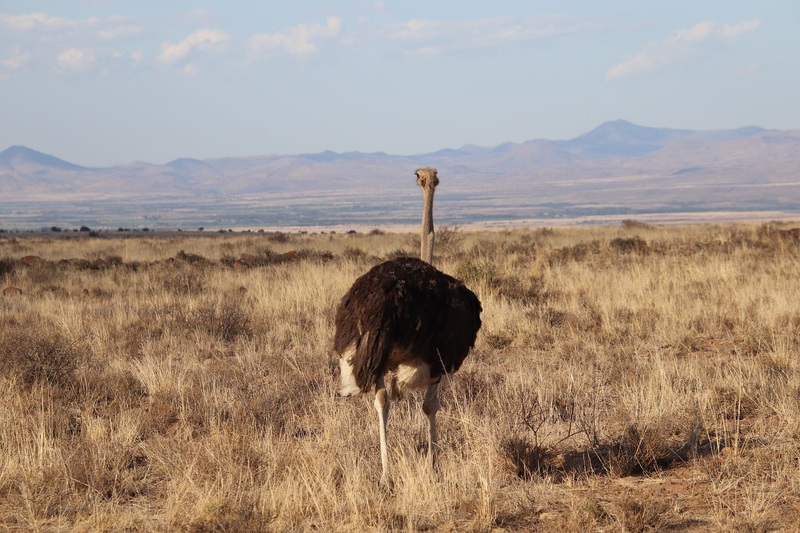 Although I had seen Ostriches in the Johannesburg Zoo before then, it was very exciting to see them in great numbers in the Oudtshoorn area on that trip. 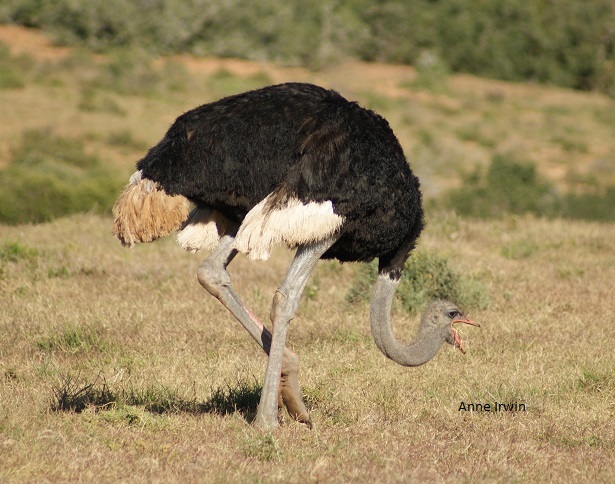 The image of the male Ostrich below was taken much more recently in the Addo Elephant National Park. 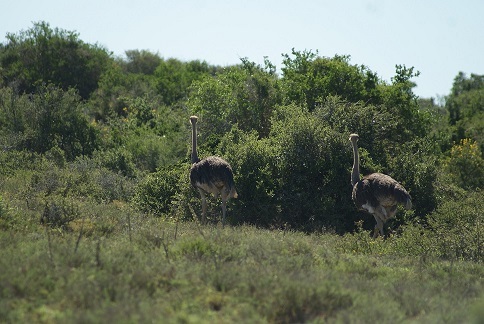 Even more exciting was actually seeing ostrich eggs in the veld. My father bought some eggs and, not wishing to break the shells (which are very hard, by the way), a hole was made in order to blow the egg to release the contents. As one Ostrich egg is said to contain the equivalent of two dozen hen eggs, there was plenty to feed a family of six for breakfast! In the image below I am holding the bucket to catch the contents, while my eldest brother is blowing an ostrich egg and my youngest brother is holding it carefully. Judging from the background, I imagine we must have pulled off the road somewhere to make breakfast whilst travelling. 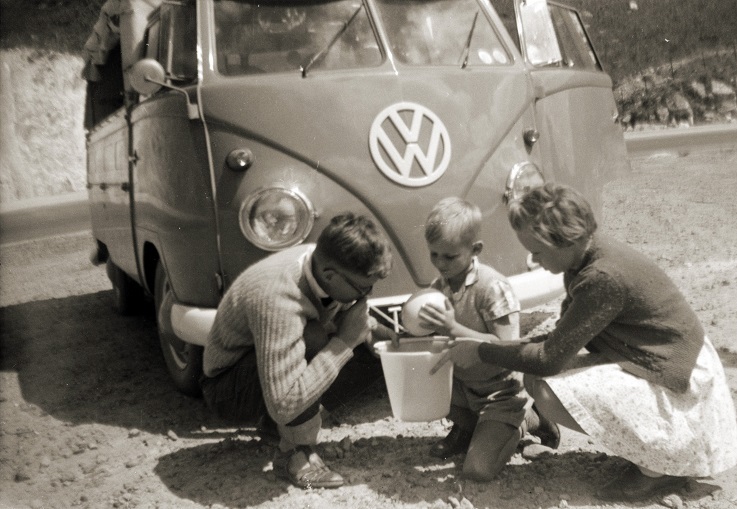 You can see our Volkswagen single-cab truck had a canvas canopy on the back with roll-down sides; this is where we children made ourselves very comfortable on our journey around the country. Note the split windscreen – something we do not see anymore! We tend to take these enormous birds for granted in South Africa. It generally takes tourists seeing them for the first time to remind us of how wonderful they are – and they are wonderful birds! 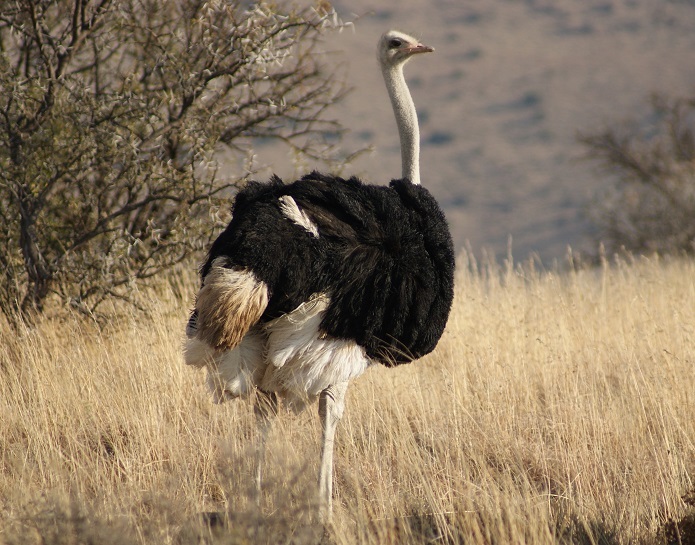 My first introduction to ostriches was in the Johannesburg Zoo. I was four years old when my father held me up to feed peanuts to the ostriches penned behind a thick fence. I will never forget that ‘scary-happy-tickling’ feeling of the ostriches nibbling the palm of my hand. It was there that I first learned that ostriches also swallow pebbles to help grind their food as they have no teeth – at the time I was very relieved about the latter! 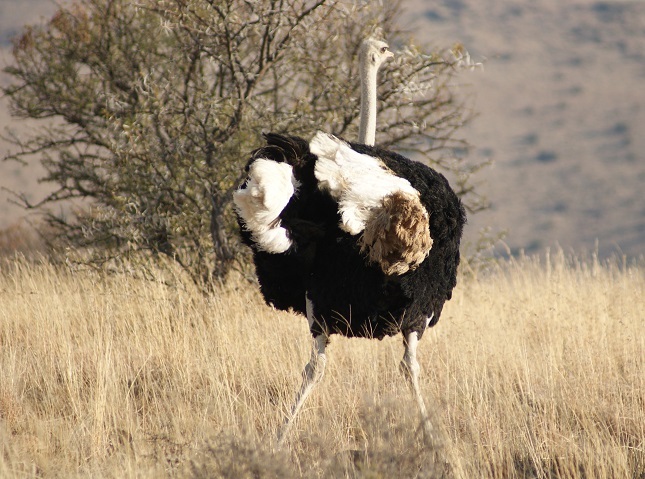 We all know that ostriches are the world’s largest birds and that they cannot fly. They can run very fast though – up to 70 km/h. 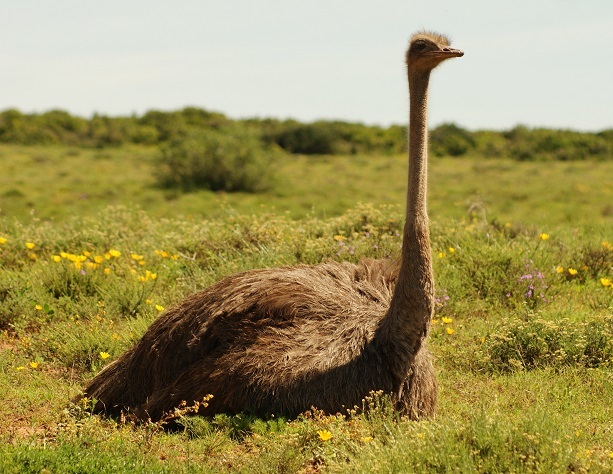 Once we experienced some ostriches sprinting ahead of us on the Makgadikgadi Pan in Botswana and were amazed to discover how long their strides were: at least five metres! On another occasion we were enthralled by the loud booming noise and dramatic flapping of wings in an ostrich mating ritual close to the Hapoor Waterhole in the Addo Elephant National Park. 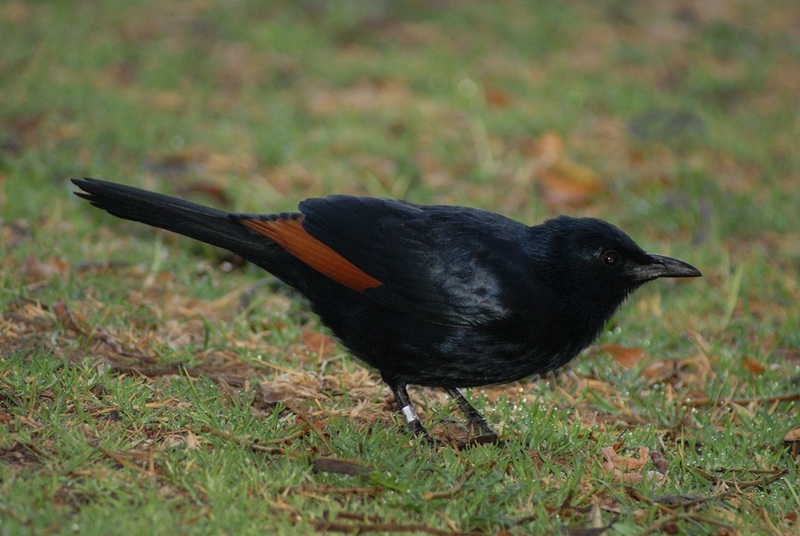 Males and females take it in turns to incubate the eggs. The more drab colouring of the female suit the day, while the dark male blends more easily into the night vigil. Here are two images of a female sitting on eggs. 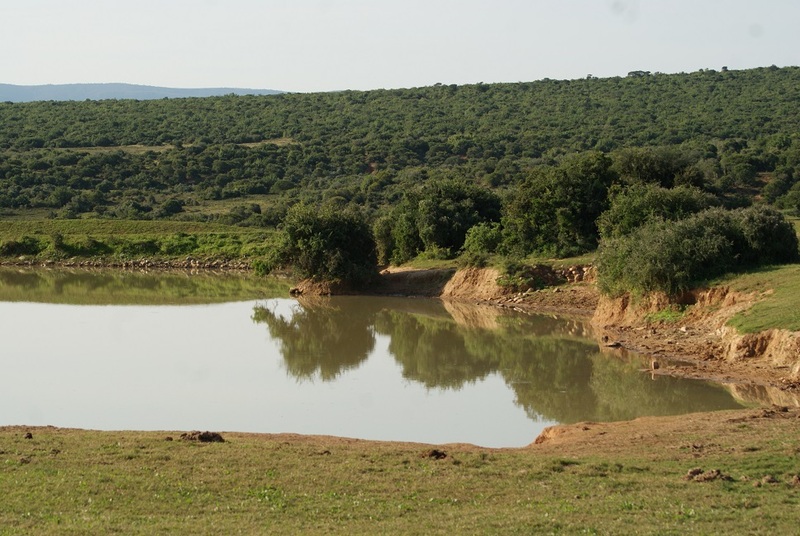 The first was taken in the dry landscape of the Mountain Zebra National Park and the second in the currently flower-strewn Addo Elephant National Park. 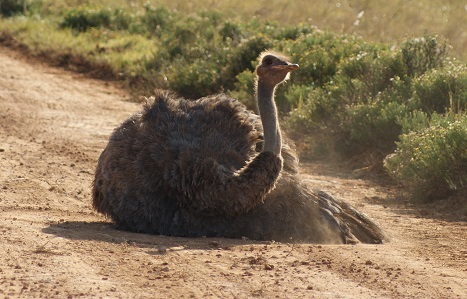 Ostriches also indulge in dust bathing as this one is at the Addo Elephant National Park. Apart from the joy of spotting ostriches in the wild, we have become used to seeing them on farms in both the Eastern and Western Cape. Even so, they remain fascinating creatures to observe. The dew was still thick on the ground and glistened like a myriad diamonds in the early morning sun when we entered the Addo Elephant National Park for the second time in just over two weeks. It was a gloriously clear winter’s day that warmed up gradually from 9°C to a very comfortable 23°C by the middle of the afternoon. Warthogs were the first animals we spotted. 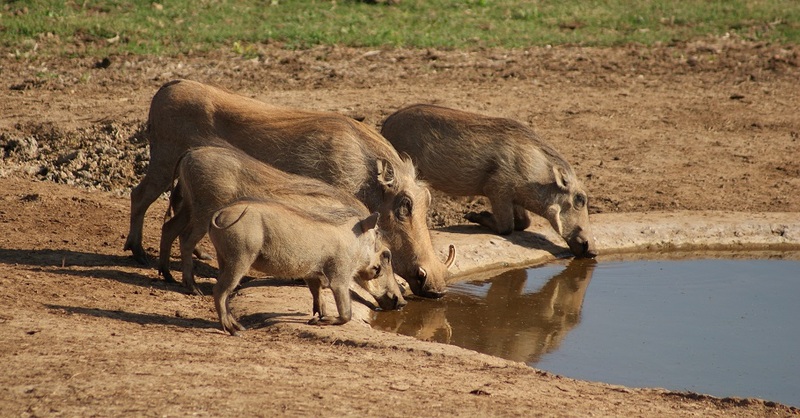 They are ubiquitous: mowing the road verges, drinking from waterholes, and generally moving through the veld in family groups. 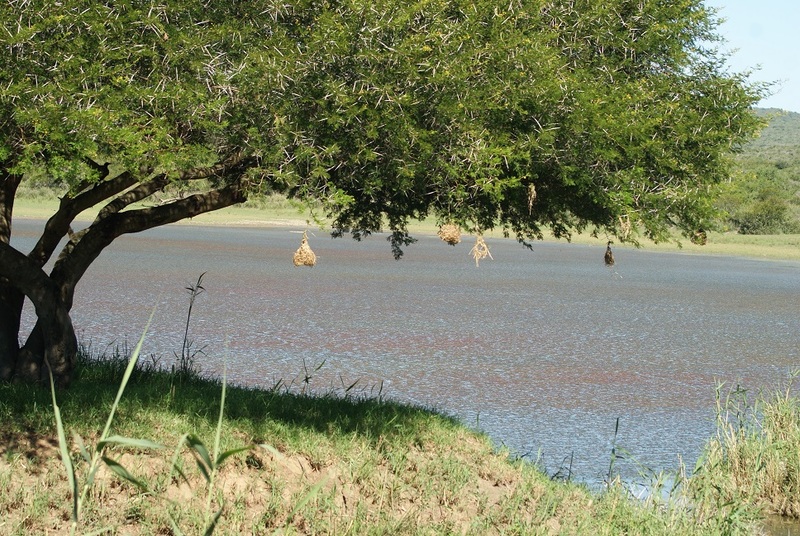 Birdwatching became easier once we had emerged from the Eastern Cape Thicket, along with seeing more game. 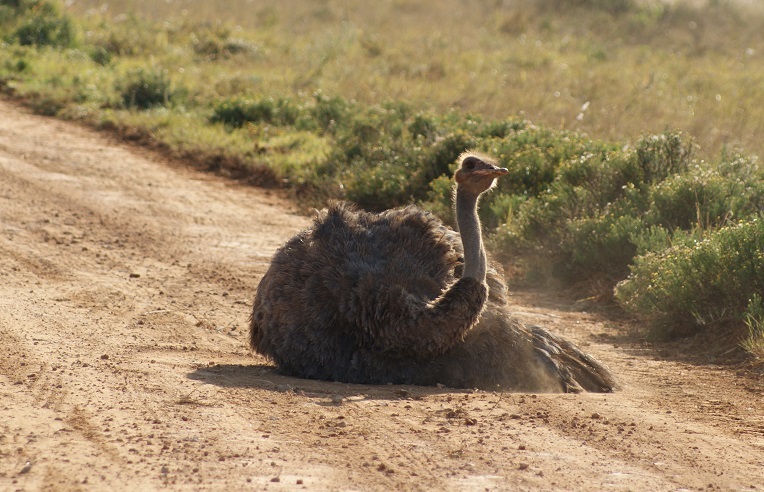 A female Ostrich stopped us in our tracks as she calmly proceeded with her dust bath on the Mbotyi Loop, sweeping her head and neck along the dusty ground and fluffing out her feathers. 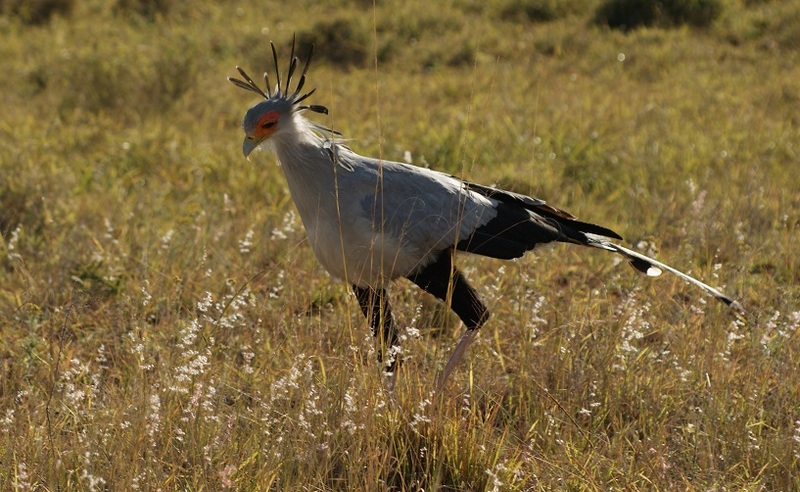 Another pleasant surprise came in the form of a pair of Secretary Birds striding purposefully across the veld, coming close enough for us to see their fine crests that earned them their name because it is reminiscent of the quill pens 19th century secretaries tended to stick in their hair or wigs. 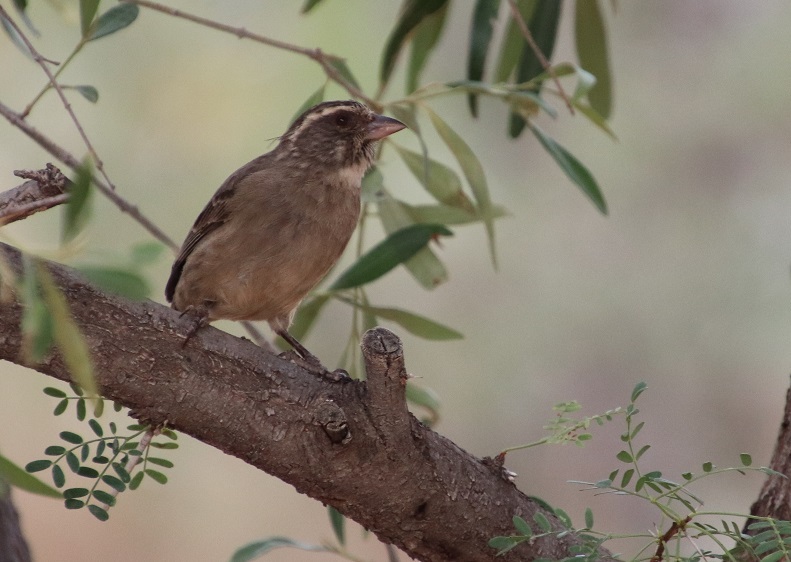 Two other unusual bird sightings were a pair of Denham’s Bustards and a glimpse of a Burchell’s Coucal. The latter scuttled through the undergrowth next to the road before I could even lift my camera. This behaviour is so different from the ones in the Kruger National Park. 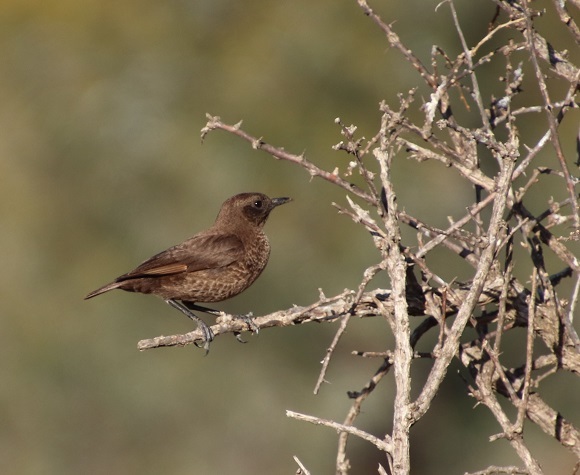 There we saw several Burchell’s Coucals flying across the open veld, seemingly content to remain on their prominent perches for a while as they surveyed their surroundings. Majestic looking kudu, delightful zebras and shining hartebeest abounded throughout the Park, which was alive with the shrill answering calls of Sombre Bulbuls and sprinkled with Fiscal Shrikes at every turn. 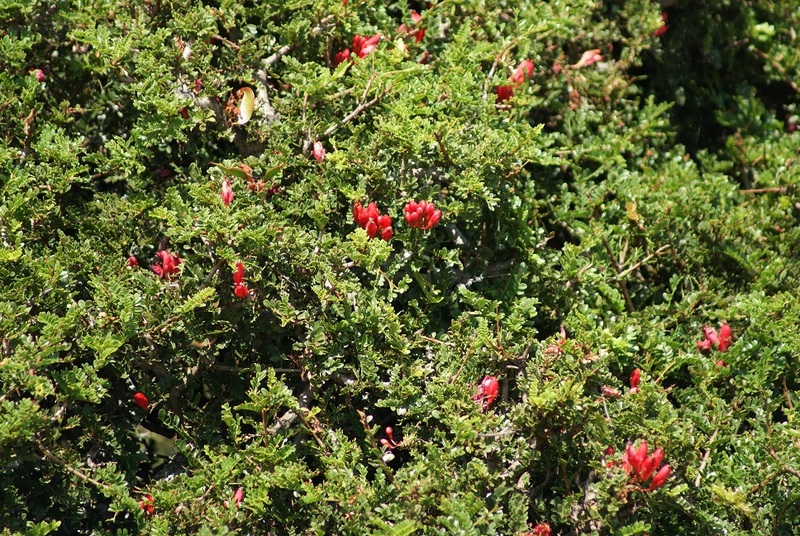 The veld is still relatively green and is brightened by a variety of different coloured blossoms: pale blue Plumbago, bright red schotia, orange and yellow aloes, bright yellow canary creepers, orange Cape honeysuckle, purple verbena, and blue felicia. 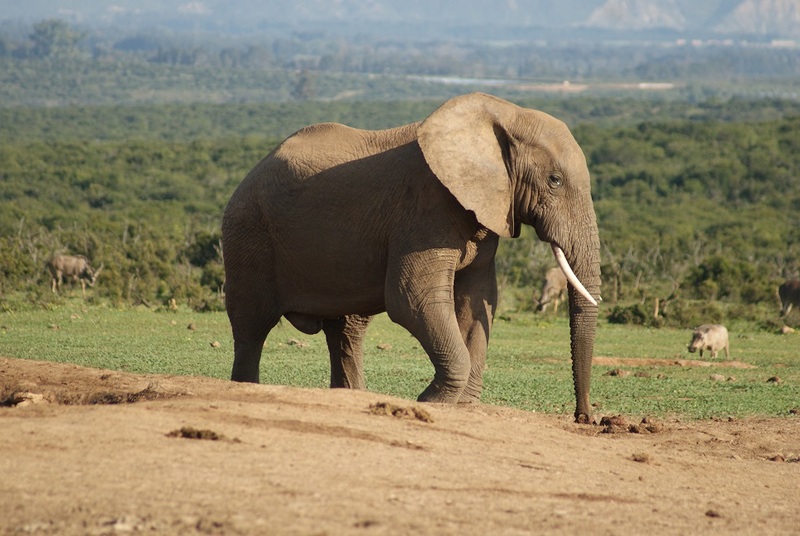 Unfortunately we arrived at Hapoor just as an enormous herd of elephant was dispersing into the veld. A few stragglers remained for a while, affording us the opportunity to watch them. Rooidam was full of water. Oddly enough there wasn’t even a pair of Egyptian Geese to be seen. 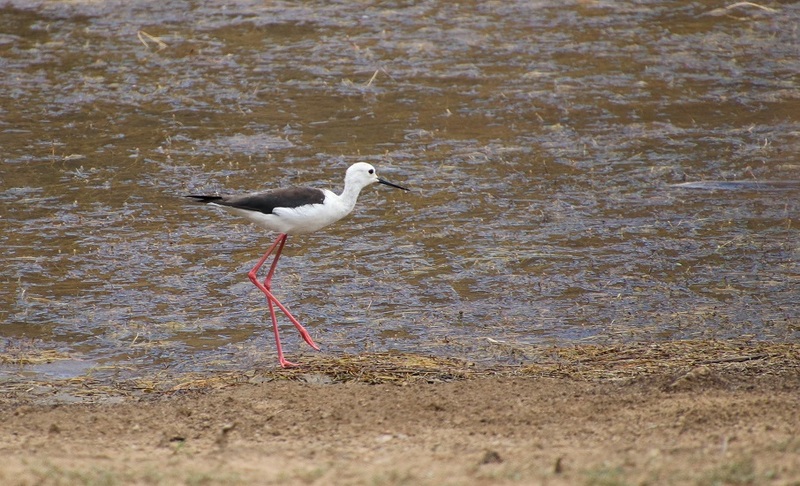 This is in contrast to Ghwarrie Dam, where we watched two Blackwinged Stilts work their way through the shallow water, and at Domkrag. The sun was already low in the sky when we nosed our way homewards, having enjoyed a brief look at an elephant at the waterhole at the Main Camp and marvelled at the pink-tinged clouds on the western horizon. At 39°C the air was breathless even in the shade. A drive into the country was called for and so we headed along the Fort Beaufort road to the 45 000 ha Great Fish River Nature Reserve in the middle of Sunday afternoon. 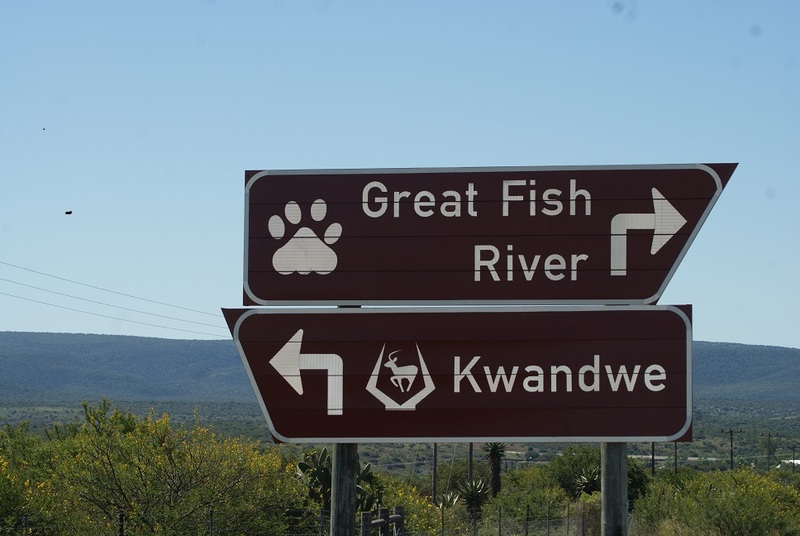 As there was only time to briefly explore the wilderness area we used to know as the Andries Vosloo Kudu Reserve, we paid our modest entrance fee and entered at the Kamadolo Gate. 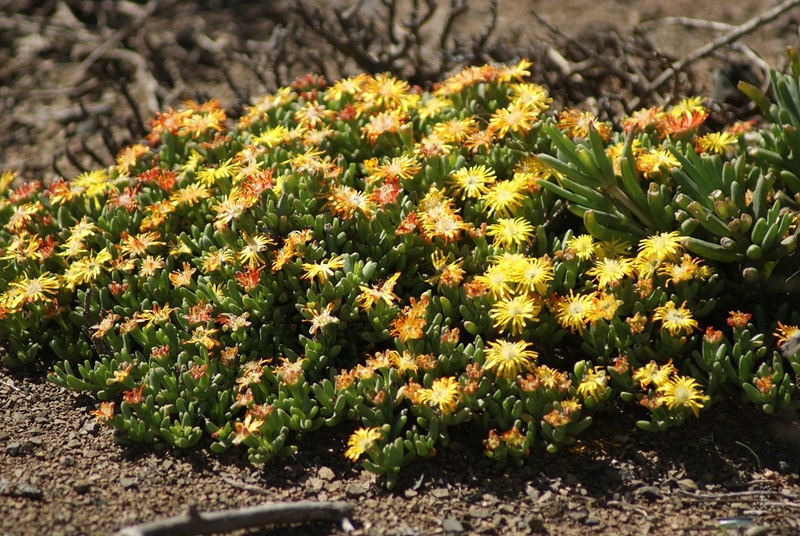 Our journey began along what looked like a smooth gravel road brightened on either side by bright displays of the orange and yellow flowers of the finger vygie (Malephora crocea), growing in the large open sandy patches of the veld. These plants can clearly withstand the extremely harsh conditions that prevail in this section of the nature reserve and look beautiful in bloom, especially being highlighted as they were by the unrelenting sunshine. 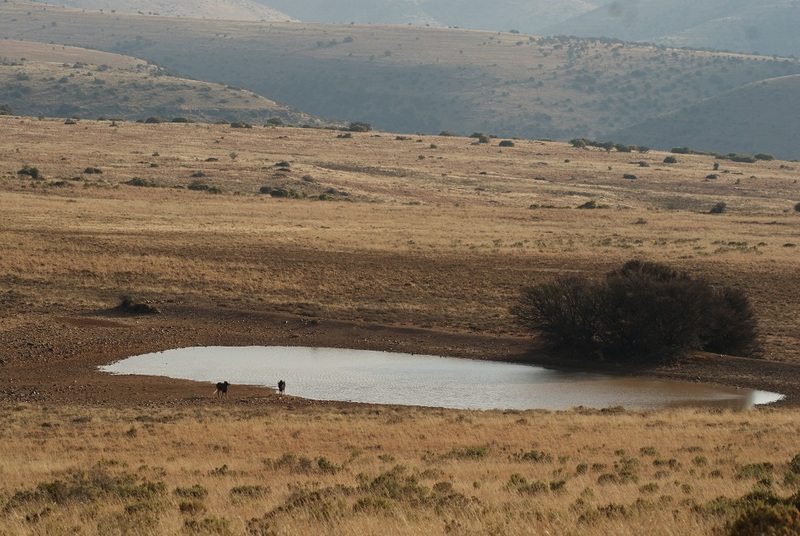 The rugged terrain and the vegetation of the valley bushveld is harsh at the best of times. On Sunday, however, we could feel the heat coming in waves as it bounced of the rocky ground along with an airlessness as if the breezes had forgotten how to blow in that part of the world. The road soon deteriorated into a rough, narrow track, deeply rutted and uneven in places. 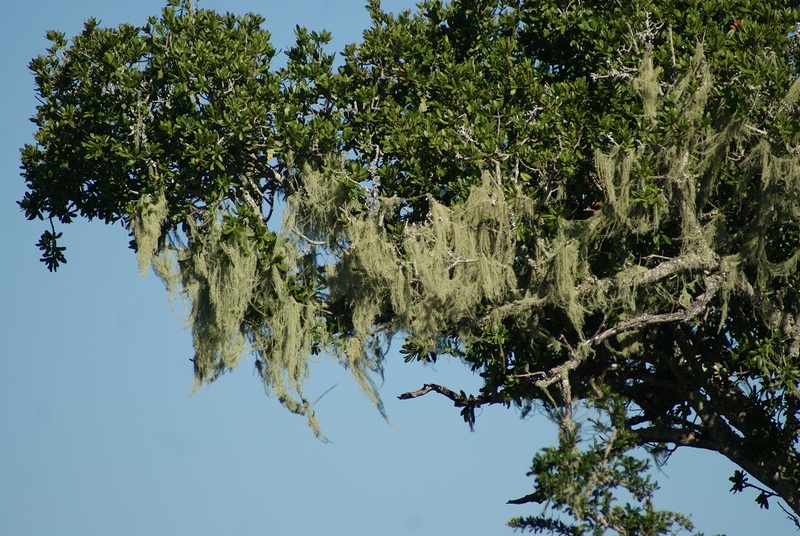 Sections of it are overhung with thorny acacia trees; at times it dips through dry water courses; and leads one bumpily up hills and around sharp corners. 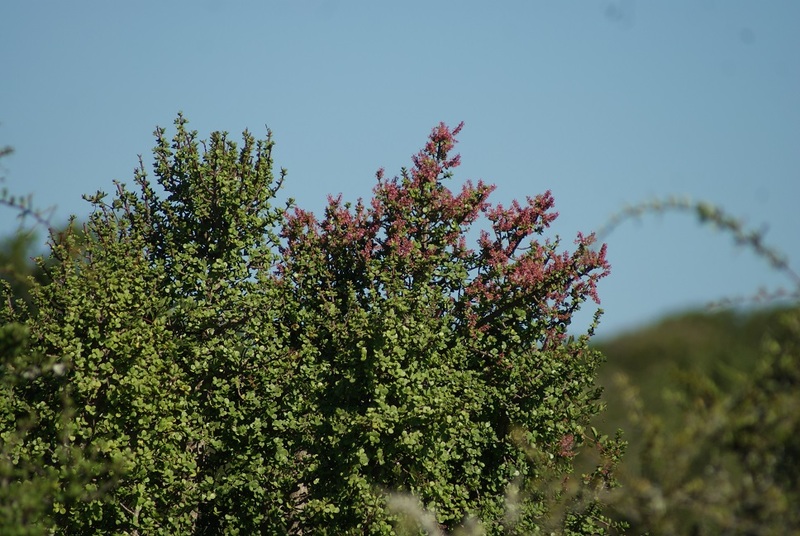 With the recent rains has come a softening of this harsh terrain in the form of a flush of green grass, leafy trees and the flowering of that very important fodder plant, the spekboom (Portulacaria). 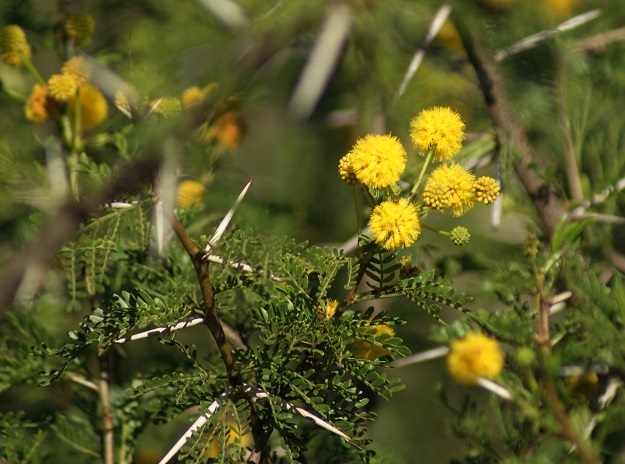 The stands of Acacia karoo are also in bloom, their puff-ball yellow flowers emitting a wonderful scent carried across the veld in the hot air. 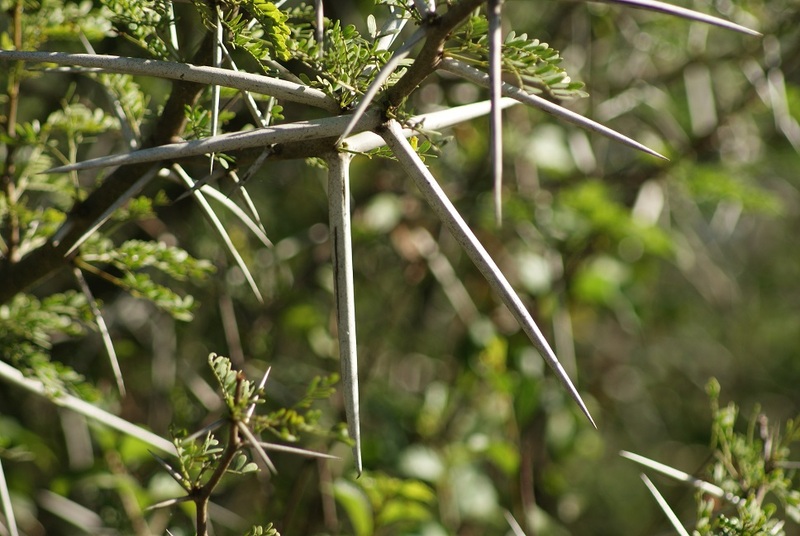 They bear ‘no-nonsense’ thorns too! We were not expecting much in the way of birds or animal life in that wilting heat. 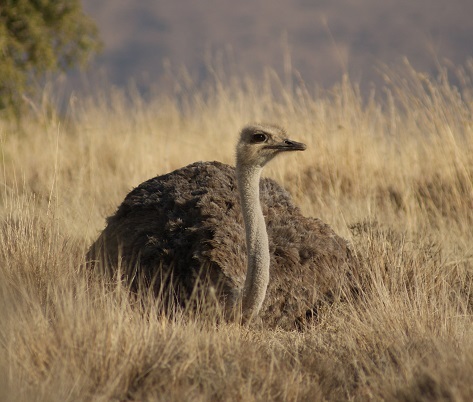 Nonetheless, a few female ostriches passed us as we headed for the Kentucky Bird Hide. It was wonderful to see water at the hide along with a number of yellow-billed ducks sitting along the edge, in the shade cast by the nearby hill. 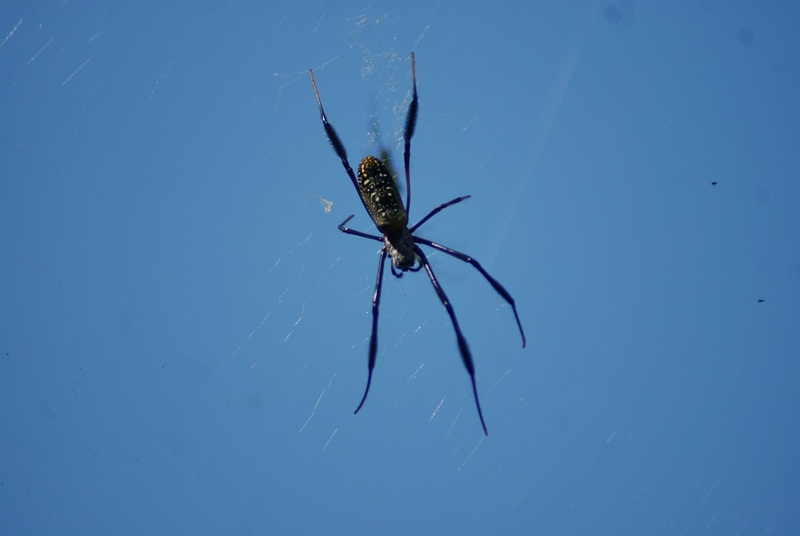 Coming out of the hide, I happened to look up at the enamelled blue sky and saw this spider sitting in the middle of its large web, just above the height of my head. I have no idea what species it is, but it had no intention of moving. Other surprises lay in store during the limited time we had left before the gates closed (we were told) at 5 p.m. 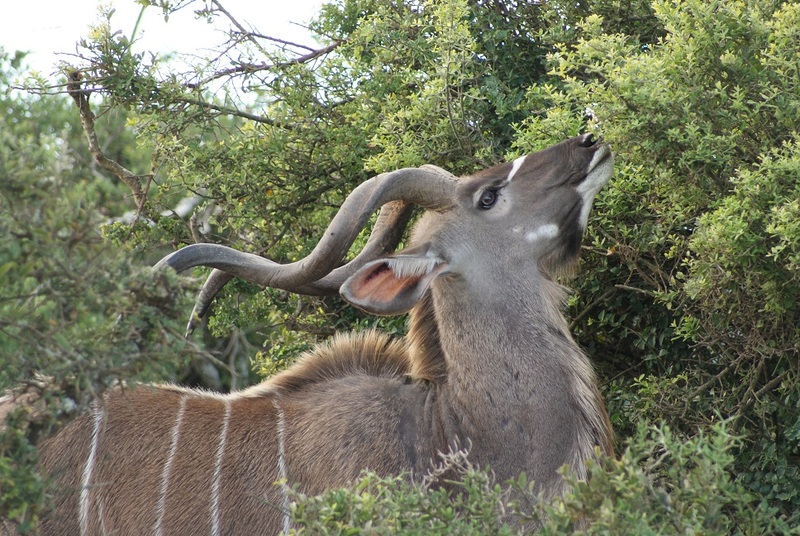 Among these were several majestic-looking kudu bulls. Unfortunately, they all appeared to be skittish and moved off quickly at our approach. Given the condition of the road, I imagine they could hear us coming way before we even spotted them! 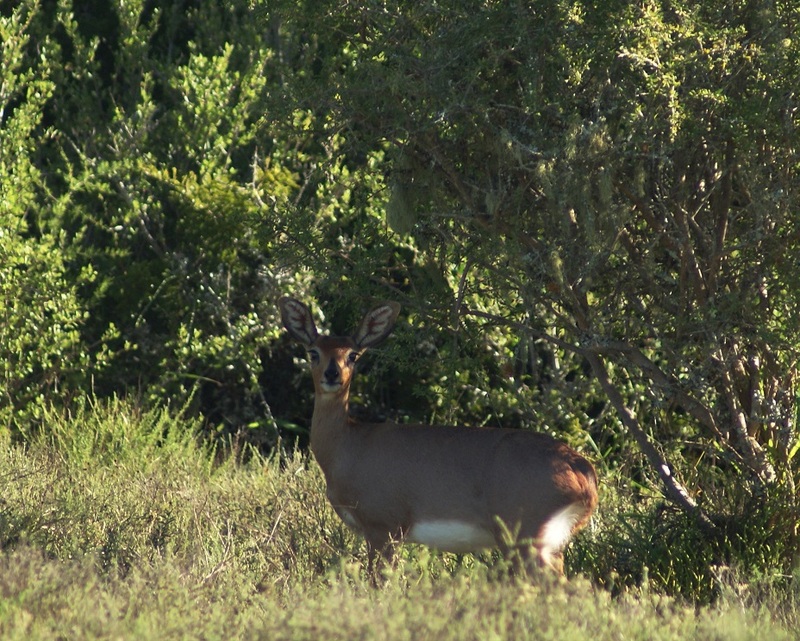 Another was a steenbok crossing the road ahead of us. It obligingly stopped a little distance away so that we could get a reasonable view of it before it disappeared behind some shrubs. 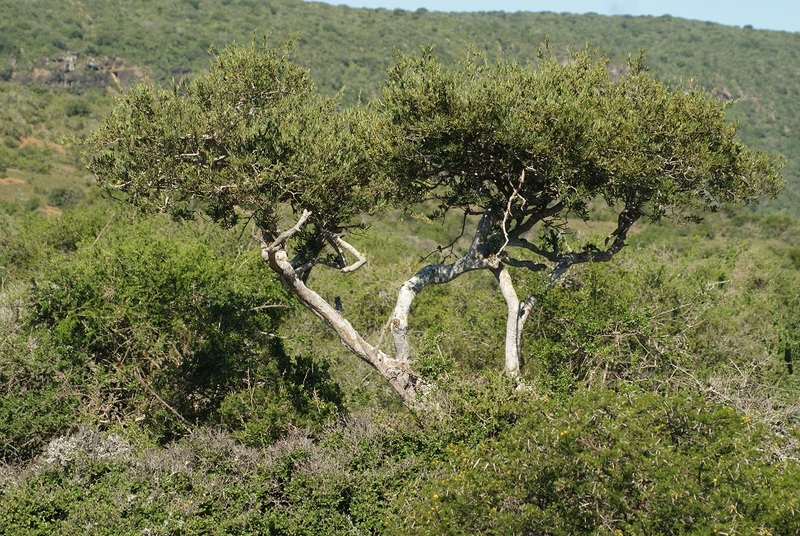 Several iconic Shepherds trees (Boscia albitrunca) with their characteristic white trunks cried out to be photographed in the late afternoon light. It seems odd to see old man’s bear lichen (Usnea) growing out in the open, where it is exposed to the relentless rays of the sun. 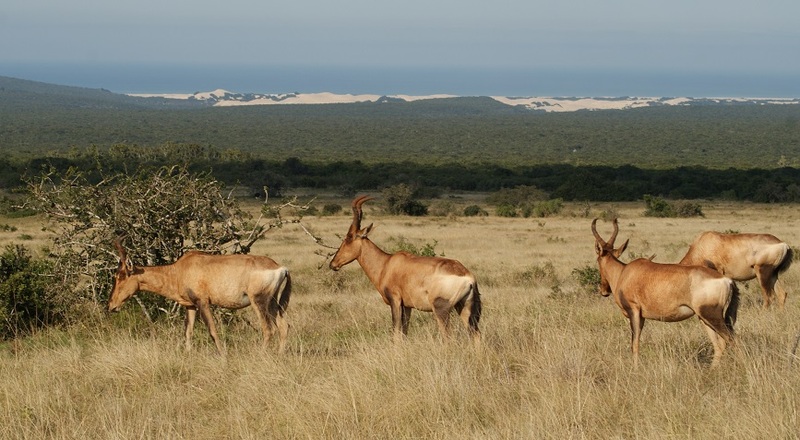 I tend to associate it with the dampness of the forests along the Tsitsikama coast. 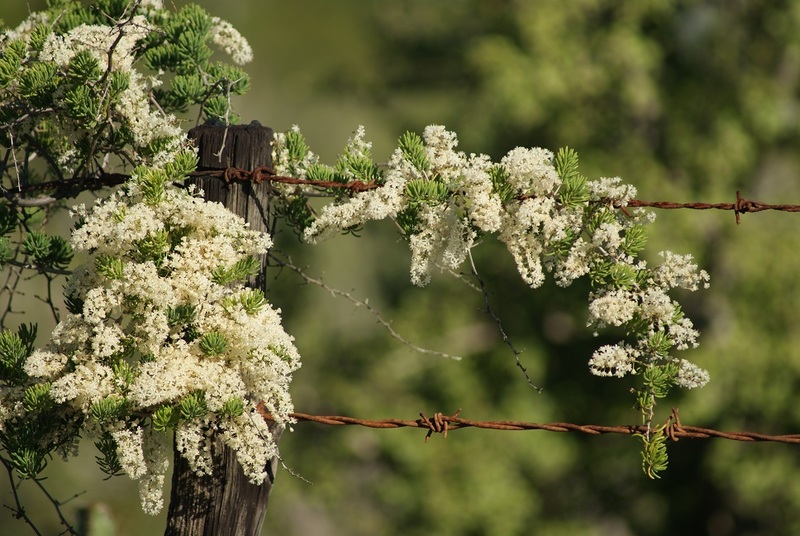 And, how lovely to see these pretty creamy flowers gracing the weathered fence posts. 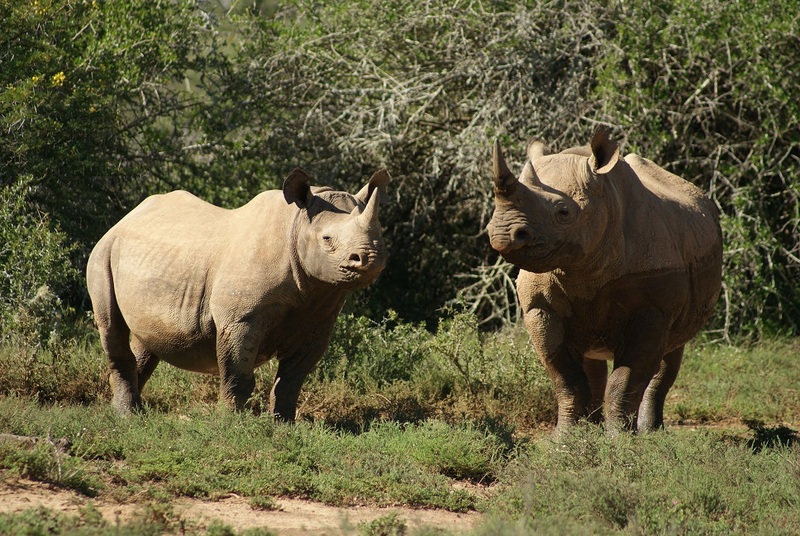 The biggest surprise of all though, and one which made our trip in the heat even more worthwhile than we had imagined, was coming round a corner to find two black rhino watching us! Judging from the tide-marks along the flank of the right-hand one, we must have disturbed them while they were cooling off in a shallow mud pool. Despite having come across several middens along our drive, we never guessed that we would be privileged with such a close-up view of these magnificent creatures. They made our day.